I always get a little annoyed whenever a company debuts a "launch trailer" for their game more than 48 hours before the actual launch of a product. I know why they do it (i.e. to drum up hype, prompt some attention/preorders, etc.) but it just gets to me, because I might find the game interesting, only to realize I can't play it for several more days. 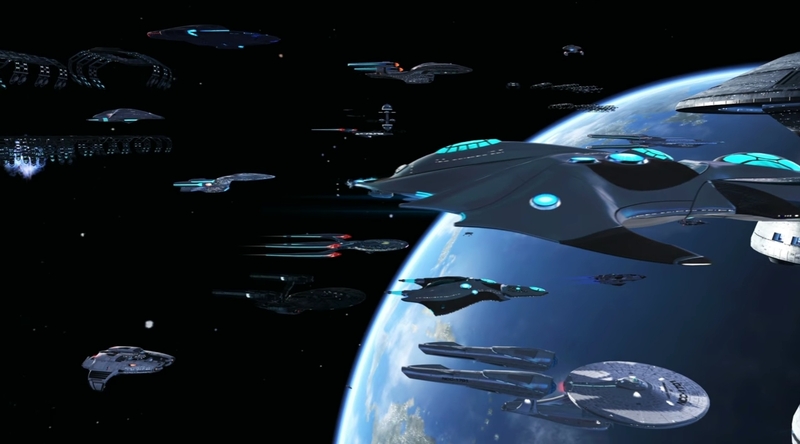 All is forgiven, though, in the case of Star Trek Online's new Agents of Yesterday expansion. After all, the entire thing the entire thing is all about time travel anyway. As such, it's only fitting that a trailer come from the future to deliver news to us primitives of one week ago. Players will travel from the time of Kirk to the post-Picard/Sisko/Janeway era (the Riker epoch?) and then leap forward several hundred years, toasting enemies across the 25th, 26th, and 31st centuries and helping to defend time itself from baddies that were once cameos in one-off episodes of The Next Generation and Enterprise. They'll also tussle with classic versions the Gorn, Klingons, and other old-school races. Other hints emerged teasing a visit to the alternate dimension of the reboot movies (now called "The Kelvin Timeline") as well as cameos from the 26th-century U.S.S. Enterprise-J (teased courtesy of Star Trek artist Doug Drexler's Facebook page). The expansion drops on July 6th, 2016.